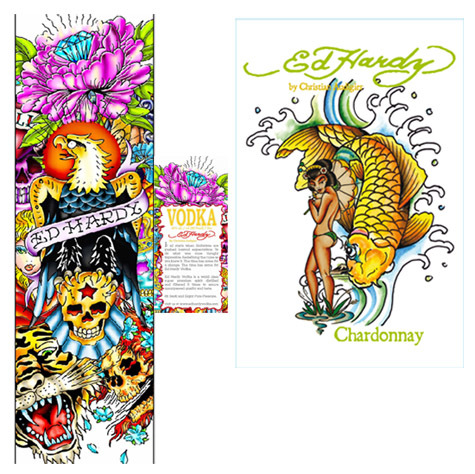 Who is Ed Hardy and why is he on so many wine and spirits labels? known as “the godfather of modern tattoo”, for his sophistication, depth and sense of experimentation. California native Don Ed Hardy is recognized around the world for his technical brilliance and mesmerizing imagery. Don Ed Hardy pulls from life experience to meld American, Japanese, Cholo, tattoo, surf and hotrod iconography. This broad spectrum of taste and experience, coupled with an ongoing investigation of various art histories and a mastery of technique, give his work a unique range and depth. The colors on that site nearly melted the monitor. It turns out that tattoo art, on alcohol beverage packages, goes way back. Sailor Jerry Rum goes back at least a few decades. This article points out that Ed Hardy learned tattoo techniques from none other than the original Sailor Jerry.